Reading and share top 5 famous quotes and sayings about Disadvantage And Advantage by famous authors and people. Browse top 5 famous quotes and sayings about Disadvantage And Advantage by most favorite authors. 1. "The art of meditation is a way of getting into touch with reality, and the reason for it is that most civilized people are out of touch with reality because they confuse the world as it with the world as they think about it and talk about it and describe it. For on the one hand there is the real world and on the other there is a whole system of symbols about that world which we have in our minds. These are very very useful symbols, all civilization depends on them, but like all good things they have their disadvantages, and the principle disadvantage of symbols is that we confuse them with reality, just as we confuse money with actual wealth." 2. 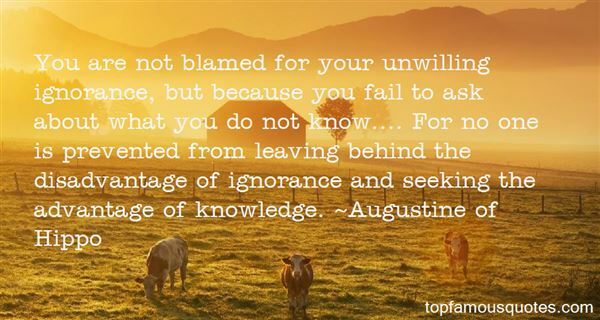 "You are not blamed for your unwilling ignorance, but because you fail to ask about what you do not know.... For no one is prevented from leaving behind the disadvantage of ignorance and seeking the advantage of knowledge." 3. "A winner, a champion, will accept his fate. He will continue with his wheels in the dirt. He will do his best to maintain his line and gradually get himself back on the track when it is safe to do so. Yes, he loses a few places in the race. Yes, he is at a disadvantage. But he i A winner, a champion, will accept his fate. He will continue with his wheels in the dirt. He will do his best to maintain his line and gradually get himself back on the track when it is safe to do so. Yes, he loses a few places in the race. Yes, he is at a disadvantage. But he is still racing. He is still alive"
4. 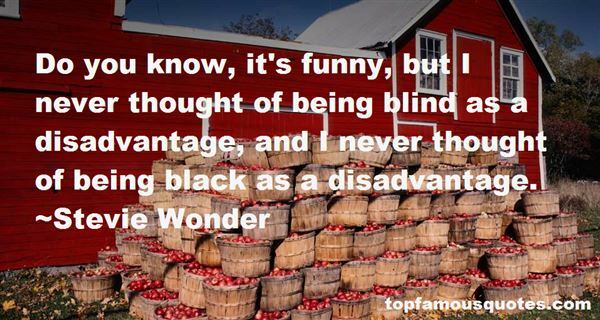 "Do you know, it's funny, but I never thought of being blind as a disadvantage, and I never thought of being black as a disadvantage." 5. "Their attitude toward another aspect of organization shows the same bias. What of the "group life", the loss of individualism? Once upon a time it was conventional for young men to view the group life of the big corporations as one of its principal disadvantages. Today, they see it as a positive boon. Working with others, they believe, will reduce the frustration of work, and they often endow the accompanying suppression of ego with strong spiritual overtones. They will concede that there is often a good bit of wasted time in the committee way of life and that the handling of human relations involves much suffering of fools gladly. But this sort of thing, they say, is the heart of the organization man's job, not merely the disadvantages of it. "Any man who feels frustrated by these things," one young trainee with face unlined said to me, "can never be an executive"." Od tada pokušavam da razumijem te ljude. Ali mi loše ide: oni se krecu u prostoru kolektivnog iracionalnog, a ako vas je Bog kaznio pa u vas usadio malo razuma, teško je probiti se kroz taj svijet džinovskih pecurki na cijim klobucima raste mahovina u obliku krsta i cetiri slova 'S', svijet nadrkanih, bijelih zeceva koji predvode horde bivših opštinskih cinovnika pretvorene u koljacke paravojske nalivene šljivovicom, svijet ludog šeširdžije koji se svakog božica preoblaci u pravoslavnog patrijarha, vadi svoj casovnik i mahnitu zemlju iza izvrnutog zrcala, u kojem se ogleda Evropa, obaviještava da Hrist nije roden 25. decembra, nego 7. januara, i da Nova godina ne pocinje prvog, nego cetrnaestog januara."